POUGHKEEPSIE, N.Y. – One of Marist College’s own faculty members has pulled off a stunning local political upset. On Tuesday, Sept. 12, Dr. Lynn Eckert defeated Peter Loughran in the Democratic primary election to represent the Ulser County Legislature’s 5th District. Eckert, who is an associate professor of political science at Marist, defeated the 23-year incumbent by accumulating nearly 75 percent of the vote. After serving on the Common Council for the city of Kingston, she will assume her new position following the general election in November without facing any Republican opposition. While Eckert was confident in the work her campaign had put in, she admitted she was “totally surprised” by the outcome of the election. At the outset of the campaign, the odds were certainly against her. Loughran had the support of most of the Ulster County Democrats, the Democratic Party Leader in the Legislature and the County Executive. Despite the longtime incumbent holding endorsements from virtually all of the county’s top party officials, Eckert won the election convincingly. Eckert believes that the outcome of the election was due in large part to Loughran’s voting record. She highlighted several instances in which Loughran voted against the interests of the city of Kingston, N.Y., which is represented by the fifth county district. He once voted with the County Executive to implement a new sales tax revenue agreement that would be detrimental to the people of Kingston. He also sided with the County Executive in the efforts to move the county court houses and county offices from Kingston to the town of Ulster even though studies showed that the move would be less cost-effective and would hurt local businesses in Kingston. In each of these cases, the other two representatives in the Legislature who represent different sections of Kingston voted with the city of Kingston and against Loughran. These decisions by Loughran angered Kingston City Democrats and motivated Eckert to launch her campaign. 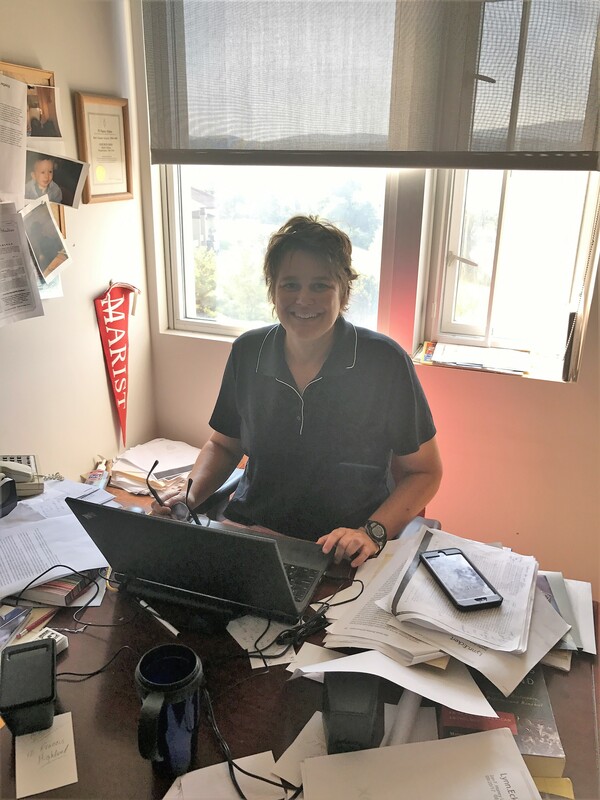 Dr. Lynn Eckert will now be balancing her work as a Marist professor and as a member of the Ulster County Legislature. Eckert credits much of her victory to the “fierce support” that followed her campaign. “If I lost [the election] that would have been my responsibility, but to win is totally a team effort,” Eckert said. Eckert received strong endorsements from groups such as Ulster people for Justice and Democracy, who coordinated a lot of local work for Bernie Sanders’ 2016 presidential campaign, and Citizen Action of New York, a grassroots membership organization. Marist junior Mike Minardi, who has been a student of Eckert’s for multiple years, shared a similar sentiment to Jayne on Eckert’s temperament for the position. Some of the issues at the forefront of Eckert’s agenda include enacting policy to help the environment, fixing infrastructure, addressing rising sea levels and shrinking wealth inequality. “The biggest issues that we’re facing in politics today have to do with redistribution of wealth,” she said. The race between Eckert and Loughran could be considered representative of the current national divide within the Democratic Party. Eckert says that she tends “to be on the progressive side” and thinks of the Democratic Party as “the party of FDR”. Candidates like Loughran represent the establishment wing of the Democratic Party, who, according to Eckert, may tend to view the Democratic Party as the party of the Clintons. “I am definitely not going to be there for 23 years,” Eckert said when asked about her future in the Ulster County Legislature. She expects to face strong Republican opposition in future elections. While Eckert acknowledges the hardship and stress that comes with running for political office, she still implores her fellow citizens to get involved. The general election for the Ulster County Legislature will take place on Tuesday, Nov. 7. The Legislature is currently controlled by Republicans, but the Democrats will only need to flip one district to take majority control. This entry was posted in Off Campus, On Campus and tagged elections, Marist College, politics, professors. Bookmark the permalink.